Val & Julie Black are very happy to announce that our granddaughter, Amanda George, will be helping with the future posts on the web page of Covenant Messenger Ministries. Amanda, a mother of three, keeps very busy with her family. Her husband, Jim George II, is assistant Pastor of Relevant Church in Elkhorn, NE. In addition to raising their three little ones, Amanda is very active in the church. She recently finished writing the curriculum for Children’s church. 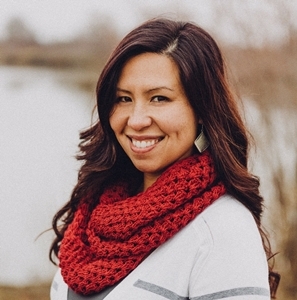 Amanda is also very active in Trades of Hope, a Fair Trade, “missional” business assisting women around the world to rise out of poverty by helping them create sustainable businesses. Amanda and her sister, Sasha, also have a business creating crafts and refinishing furniture. With all these activities going on in her life she is still willing to help “Grandpa & Grandma” with the web page and we are very, very grateful. From time to time, as she is led by the Holy Spirit, she may also post articles on the web page and we know you will be blessed.